We love Hayley and Tyler! It was so special being a part of their wedding after photographing Hayley’s Bat Mitzvah back in the day. Celebrating life’s milestones and taking that journey with our clients is why we do what we do. Hayley and Tyler’s wedding day began at The Plaza Hotel. The pink floral arrangements and bridal bouquets designed by Matthew of Atlas Floral Decorators paired perfectly with the gold elements of The Plaza Hotel decor. Guests celebrated with Hayley and Tyler, dancing to the music of Harris Lane of Hank Lane Music and Productions. A celebrity performance by Gary U.S. Bonds made the evening even more memorable. The towering wedding cake designed by Ron Ben-Israel Cakes memorialized Hayley and Tyler’s special day. Enjoy the photos below and the special Q&A with Harris Lane of Hank Lane Music and Productions! Q: What style music did you play at the Cooper/Schapiro wedding? A: We had a 12 piece band playing a mix of Top 40, Rock and Motown. Q: What’s the best part of working a wedding at the Plaza Hotel? A: I do enjoy weddings at The Plaza. My favorite is the decor of the ballroom and the staff is great. Q: What’s the most popular wedding first dance song? A: “All of Me” by John Legend. Q: How long has Hank Lane Music been in business? A: We’ve been in business for 35 years and I’ve had my own band for 22. Sarah Merians met with Michelle Farber of M Studio Events to photograph product samples here at our studio. Based on a client’s event theme and color scheme, Michelle and her team at M Studio Events design a unique branding plan that includes giveaway pieces, design elements and more! Dubbed as the “party concierge,” M Studio Events can assist in all facets of your next event, from party coordination to branding and so much more. To learn more about Michelle and her company, visit her on Facebook ( M Studio Events: Party Concierge) or at www.mstudioevents.com. Jacqui’s Bat Mitzvah weekend was a blast! The festivities began at Congregation Shaarei Shalom in Riverdale, where Jacqui read from the Torah while mom Alexandra and dad Billy proudly watched as their daughter became a Bat Mitzvah. The party continued on Saturday at Arena where Jacqui, clad in a gorgeous gold and silver Mitzvah dress, shined as she danced the night away with friends and the beats of Tom Kaufman Productions and his MC/DJ duo. A breakdancing troupe took the stage front and center for an awesome performance that Jacqui and her friends and family watched from the dance floor! Guests had the opportunity to write a note to the Bat Mitzvah girl in a customized photo sign-in book we designed, filled of images of Jacqui all around New York City from Times Square to Harlem! Sarah Merians had fun following Jacqui around the city. Our sign-in book albums can range in style and each book is custom made. Take a sneak peak at two different versions of Jacqui’s sign in book below! Our studio also provided a photo board used as a decorative addition to the Arena event space. Check out how these favorite images of Sarah’s from the city photo shoot turned into Jacqui’s sign-in book! Jacqui’s favorite places to visit, hobbies and colors were on display front and center at her Mitzvah bash, thanks to the incredible creativity and coordination of event planner and branding expert Michelle Farber of M Studio Events. 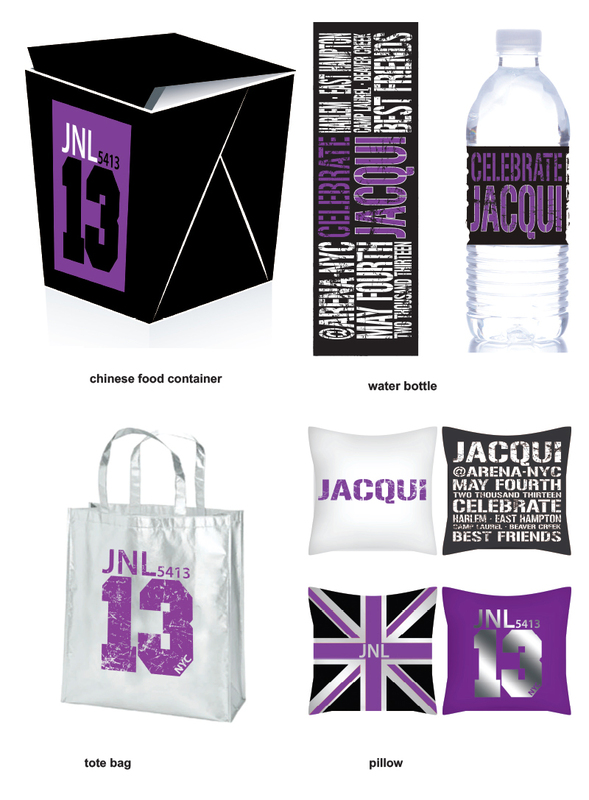 Known as the “party concierge,” Farber created a branding theme for Jacqui’s Mitzvah from the purple, black and white color scheme to designed logos used on water bottles, coffee cups, napkins, pillows, and even socks for the girls to dance in! Every décor detail was accounted for from the branded shirts the dancers wore to customized chocolate bars and a Dylan’s Candy Bar candy display! Let’s not forget the customized candy sushi and branded take-out containers! What is candy sushi? Well, Krispy treats and gummy worms, of course! 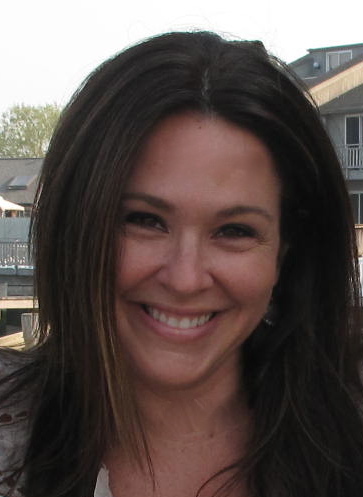 Check out more on Michelle Farber and her amazing branding and product work she did for this client. Whether it be party coordination services or branding you need for your next event, M Studio Events is a great resource! M Studio Events: Party Concierge is more than just a full-service event planning company. As the premier event planning company in the New York area, we are truly invested in making events unique and original. M Studio Events: Party Concierge specializes in transforming environments to create distinctive events. Whether it’s a Mitzvah celebration, milestone birthday, corporate gathering, or your dream wedding — we will work with you to make your special occasion unique and memorable. “Organization, creativity and working with amazing people will get you to your end result,” — this is how M Studio Events: Party Concierge has set ourselves apart from other event planners. We can provide select services from customized invitations, personalized favors, apparel and accessories, to branded dessert tables. M Studio Events: Party Concierge can work with you to organize your entire event from concept through every aspect of execution. We can assist you with all aspects of your plans from our first consultation, to the day of your event, and every moment in-between.